Slashed housing benefits, a further reduction in the state’s welfare cap and cuts to in-work tax credits are on the table as Chancellor George Osborne prepares to fillet Britain’s welfare state in his so-called “emergency budget” next week. Osborne will deliver the majority Conservative government’s first budget since taking office, a mere eight weeks after the May 7 general election. Analysts say the planned cuts will be twice as deep as those implemented during the previous government, a Tory-Liberal Democrat coalition. Osborne is expected to claim that former Labour Prime Minister Gordon Brown left the UK with a “bloated” welfare state when leaving office in 2010. He will argue Brown’s policy path of increasing tax credits skewered Britain’s welfare system, while encouraging workers to depend on the state rather than their chosen career path for a reasonable income. Osborne will combine the £12 billion of welfare cuts, tabled prior to May 7, with an increase in the personal tax allowance and a pledge to do more to convince employers to raise salaries to make up for income losses. Some observers say he will suggest that employers pay their staff a “living” wage of £9.15 per hour in London and £7.85 per hour in the wider UK. In terms of slashed tax credits, child tax credits are expected to be predominantly hit. Ministers are also considering making those who claim housing benefit pay for a proportion of their rental costs. At present, housing benefit covers the full cost of tenants’ rent, but could be slashed so they must cover at least 10 percent of these costs themselves. Ministers have previously vowed to cut housing benefit for 18 to 21 year olds. Critics also suggest Osborne wants to see Britain’s welfare cap slashed further, from its current level of £26,000 to £20,000 outside of London and the southeast of England. Further speculation has arisen that the Chancellor may attempt to soften this blow by bringing in reforms to the bedroom tax. The policy was introduced under the Tory-Lib Dem coalition. It reduces the welfare tenants receive if they are deemed by the government to live in accommodation too large for their requirements. 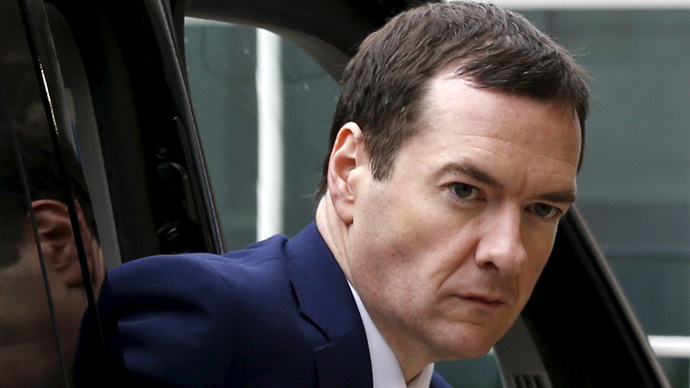 The Chancellor is facing pressure to cut the upper tax rate to 40p for those who earn in excess of £150,000. While Osborne attempted this under the coalition’s term in government, the move was blocked by Lib Dem leader Nick Clegg, then the deputy PM, in 2012. The Lib Dems also warned the Conservatives against reducing Employment Support Allowance. Conservatives, meanwhile, are determined to portray Labour as a welfare party and their own as one of a strong work ethic. Osborne’s biggest fiscal pledge prior to the election was to cultivate a budget surplus in “normal times.” But the government’s precise definition of normal times or a budget surplus remains unclear. Britain’s Office for Budget Responsibility’s recent forecasts, published in tandem with March’s Budget, suggest Britons can expect deep cuts in the coming years. PricewaterhouseCoopers’ (PwC) public sector chief Mike Turley predicts cuts in 2016-17 and 2017-18 will be twice as deep as any annual cut implemented by the coalition while in government. “Watchdogs and commentators in the NHS, local government, policing and further education have all sounded alarms about financial stability and the impact of further austerity within their sectors,” he said Friday. Meanwhile, a growing chorus of economists have condemned Osborne’s proposed cuts. They warn they are deeply misguided and will drive further inequality in the UK. “The effects of austerity cannot be overstated,” Jo Michell, a lecturer in economics at the University of the West of England (UWE), told RT last month. “Britain has experienced the slowest post-crisis recovery on record,” he said. Michell said real wages for the average British worker have dropped by roughly 10 percent since the 2008 crash. “Despite claims that we are all in it together, the burden of austerity has been disproportionately placed on the shoulders of the least well off and the most insecure,” he said. Michell attacked Osborne’s economic foresight. “There is no long-term economic plan. The Conservative government are committed to a small state and a deregulated market economy,” he said. Michell said an alternative economic model is possible. But he insisted it would require a root-and-branch reappraisal of how the state interacts with international markets.